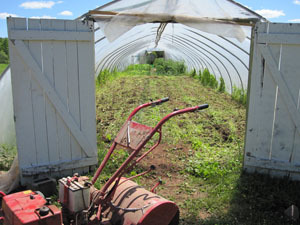 Today the buckwheat crop in the greenhouse reached its full size and needed to be tilled in. I should explain that Alice and I garden in only half of our garden space both in the greenhouse and in our outside garden each year. 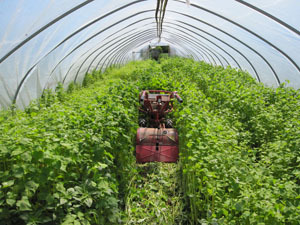 In the other we plant as many crops of buckwheat as we can, and when it gets full size, we rototill it in for green manure. We usually get 3 crops a year, and after the last one we plant a cover crop of annual rye to give the soil a green blanket for winter. The next growing season, we swap halves and grow buckwheat in the other side. Over the years we feel it has improved our clay soil. I usually let the soil rest for a few days, till it again, and then plant the next crop of buckwheat. Our first tomato is doing great. It is on our outside hanging plants, so it is a Roma. 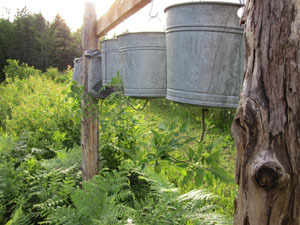 They are extra work because they need daily watering, but we wisely put them near the walkway to the pond anyway, so I just divert one of the buckets to the hanging tomatoes each day. Alice is still plugging along with her cleaning. I saw her up on the counter top like a bad cat, and she looked so cute up there that I had to take a picture. 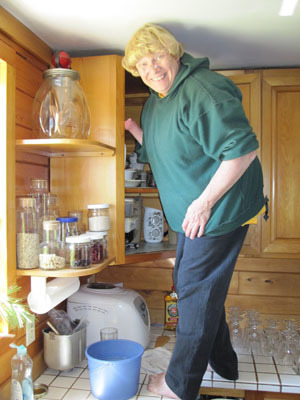 She likes to go through each cupboard, remove everything, clean the cupboard, and put things back. I saw great sense in this the other day. She was doing this job under the kitchen sink, and came and got me to report there was water on the cupboard floor under the sink. On investigation, I determined the drain pipes had come apart with the tiniest gap between them. Tiny enough that it isn’t obvious, but big enough such that when the sink empties, water drips out and onto the floor and the contents. I had to take several pipes apart under there to get at the problem, and discovered the crossover pipe was almost completely plugged with what plumbers call “pipe guck.” (just kidding, I don’t know what it is called, but it is miserable stuff!) I took the pipe into the workshop and worked a wire through it, and attached a piece of rag to it, and pulled it through numerous times. GUCK! Whatever we pay plumbers they earn it. This entry was posted on Wednesday, June 30th, 2010 at 9:41 pm and is filed under Uncategorized. You can follow any responses to this entry through the RSS 2.0 feed. You can leave a response, or trackback from your own site. Have been reading your blog for the past hour or so and am fascinated by life you live in the U.P. and at how different it is from the hectic B.S. that I endure here in D.C. I am envious.